“Cheerful Angel” (愛笑的天使) was written and composed by Faye Wong (王菲) for the inaugural fundraising event held on 26 Dec 2006. (Click below to listen to the song.) The foundation was initiated by Faye and her husband, in cooperation with the Chinese Red Cross, to help children with clefts. Their daughter, Li Yan (李嫣), was born with a cleft in May of that year. “Cheerful Angel” is the official theme song of the charity. There are many versions of this song on the web, but I haven’t found one that sounds really good. This version from st020.com is the best I’ve found thus far. This is an MP3 made from a video downloaded from the site. I’ll keep an eye out for a better recording. I don’t think this song was ever released on an official CD. Thus, the web versions are all we have. The production is very simple, at least in the versions I’ve heard, and the sound quality isn’t great. Still, the song is moving, capturing the overwhelming and unconditional love that a mother feels for her newborn. In “Cheerful Angel,” we see Faye at her tenderest, vulnerable yet filled with happiness and determination. This will always be one of my favorite songs. 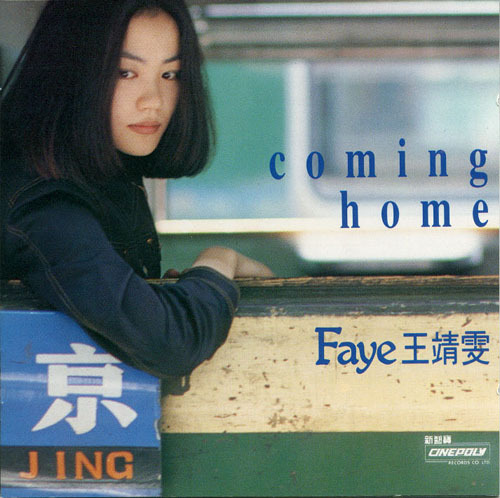 With this live recording of Faye Wong’s “Because of Him” (多得他, Do Dak Ta), I’m beginning a series on rare recordings that have never been formally released in official albums or videos. (Click below to listen to the song.) These are the ones that are floating around on the web in various degrees of quality. This is from the 1992 Creative Concert where Faye and Sandy Lam (林憶蓮) teamed up in a live duet. “Do Dak Ta” is a cover of Karyn White’s 1988 hit “Superwoman.” Faye released this song in her third album, You’re the Only One (Cinepoly, Dec 1990). C. Y. Kong has a version on his website, but it’s from the concert soundtrack and quite raw. I got this version off the video at Tudou.com. The problem with Tudou videos is the slow downloading, which translates into long pauses throughout the song. (YouTube’s a lot better in this regard.) Thus, for many (some?) of the songs I’ll be presenting in this series, the process will probably require a download of an FLV file to my PC (to avoid the pauses), a recording in WAV format, a conversion to MP3, and an upload to this blog site. In any case, I’m guessing that this is Faye’s first live concert after returning from her soul-searching sojourn to New York City in 1991. With the release of Coming Home (Cinepoly, Aug 1992) after her return to Hong Kong, she turned her fledgling career onto the fast track and never looked back. Notice her name on the cover of the album. She’s going with “Jing” and “Faye” plus “王靖雯,” Wang Jing Wen or Wong Ching Man. The emcee in the recording uses the latter rather than 王菲, or Wong Faye. 7. For the seventh best minor video, I’ve selected Faye Wong’s (王菲) English cover of Queen’s 1975 megahit, “Bohemian Rhapsody.” This video was added to YouTube by Lilac1205 on 24 Feb 2008. She/he describes it as coming from the “Faye Wong 98~99 concert.” This is a bit misleading because it gives the impression that it’s part of the Hong Kong segment of the 1998-99 Scenic Tour concert. It’s actually from the Japan leg of the tour, which was staged on March 11-12, 1999, at the Budokan in Tokyo. (Faye held a second concert at the Budokan on Nov 1-2, 2001. The DVD, Faye Wong Japan Concert, was released in Dec 2002.) Faye was the first Chinese singer to perform in this arena, which is usually reserved for massive rock concerts. “Bohemian Rhapsody” is included in the CD (released in Dec 1999) for the HK concert, but it’s omitted from the VCD/DVD (released 1 Feb 2000). Thus, this is the only video for this song, from the tour, that I could find on YouTube. This video shows what Faye can do in a fully staged Broadway musical type number. Her power and range are awesome. Watching this, I can’t help but wonder why we haven’t seen Faye in a full-blown musical film. She sings and dances in some of her films, but I’d like to see a film where her singing dominates from beginning to end. ADDED: I’ve never seen an official VCD or DVD release for the March 1999 Budokan concert. However, I know that at least one, official or unofficial, exists. I’ve seen a copy of it, but the visual quality was poor. I’m not sure if there’s a better quality available commercially. Other videos from the Budokan 1999 concert are scattered around in YouTube, and I might try to gather them when I have time.